The evaluation of the master plan for Haikou Jiangdong New District, hosted by the Department of Natural Resources and Planning of Hainan Province and the Haikou municipal people's government, took place in Beijing on Jan 27. Thirteen experts approved the plan after close scrutiny. They believed the master plan will deepen the strategic deployment of Hainan's reform and opening-up and encourage the comprehensive development of the China (Hainan) Pilot Free Trade Zone. They believed that the plan met requirements related to ecosystem restoration, coordination between urban and rural areas and development elasticity. The master plan was the result of ideas gathered from around the world. It was implemented on June 3, 2018 by the Haikou government to enhance the standards of projects. The establishment of Haikou Jiangdong New District is an important move for Hainan in promoting the construction of a free trade zone and a free trade port with Chinese characteristics. Strong support from state ministries and professionals helped propel its development. The new district is expected to strengthen reform and opening-up, help in the development of an environmentally friendly society, contribute to the international tourism consumption center and boost major national strategic service guarantees. Located in the heart of the northern Hainan Comprehensive Economic Integration Circle that links the cities of Haikou, Chengmai and Wenchang -- which contains China's only tropical and coastal space launch center -- Jiangdong New District is geographically blessed with rivers, lakes and wetlands. It also benefits from the nearby Meilan International Airport and has enough natural resources to support high levels of planning and development. 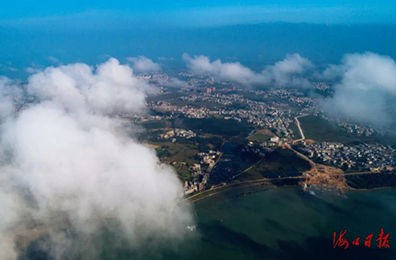 The new area covers an area of 298 square kilometers on the east coast of Haikou, the provincial capital, and will be divided into two parts: a 106-sq-km ecological region boasting a key national wetland reserve, and a 192-sq-km region that will serve both industrial and urban purposes. It will be an international trading venue for energy, shipping, bulk commodities, property rights, stock equities and carbon credits. It will host the regional headquarters of international and domestic industrial conglomerates and groups, scientific research institutions and service organizations. It will also be built into an international financial trade and education center, according to the provincial plan.